Why did New York City, particularly Manhattan, experience such explosive growth in tech start-ups at the outset of a major economic downturn? 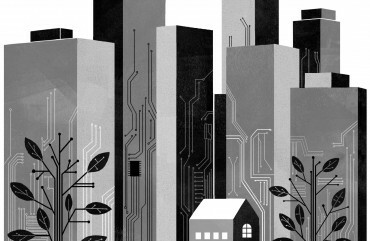 At the turn of the new century, relatively few tech start-ups were located in New York City. Silicon Valley, New England, LA/Orange County, San Diego and even upstate New York far outstripped the New York metropolitan area in the number of tech start-ups. From 2007 to 2011, however, tech start-ups in NYC grew by 32%, during a severe economic recession when other regions experienced sharp declines. This rapid growth of tech start-ups in NYC cannot be explained by overall economic growth alone, especially given that the NYC financial industry was the epicenter of the most serious financial crisis since the Great Depression. So why did New York City, particularly Manhattan, experience such explosive growth in tech start-ups at the outset of a major economic downturn? To investigate this question, the Cornell Center for the Study of Economy and Society, has embarked upon a groundbreaking study. Our approach connects entrepreneurs to their organizational field, and local state actors into a broader system of development and change. Our aim is to understand the individual role of entrepreneurs, both as actors of change, as well as economic agents receiving signals from their institutional environment. Our interdisciplinary approach—including teams of sociologists and economists—focuses analytic attention on institutions in the making of a knowledge-based regional economy. In explaining the rise of regional centers of knowledge-based economic development, our approach explores the institutional drivers of successful entrepreneurial activity. We plan to conduct basic research on knowledge-based economic development near to the timing of emergence, with a focus on the social mechanisms and institutional processes enabling and promoting this new wave of entrepreneurship. 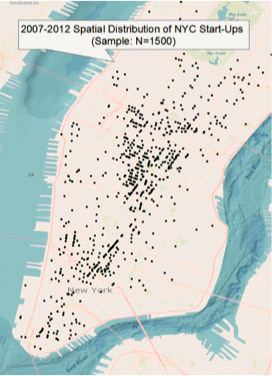 Preliminary research has shown significant evidence of cluster formation in the concentration of tech start-up firms in lower Manhattan. This pattern of cluster formation is consistent with the view that dense networks of like-minded actors and norms of reciprocity are important causal factors in the emergence of trust and cooperation, which we hypothesize enables and guides the emergence of NYC’s tech start-up economy. We have launched a follow-up survey of the tech entrepreneurs who participated in the initial stage of this ground breaking study. Our research thus far has shown that social networks and expectations have a great deal to do with the success of NYC’s Tech economy. Our research today is focused on exploring further the different ways and means that social networks and inter-firm cooperation function, how they assist entrepreneurs and strengthen the NYC tech community. We hope to uncover potential solutions and strategies that facilitate a transition to a knowledge-based regional economy. We invite you to watch the video below to understand some of what we have learned. From 2007 to 2011 high tech start-ups in NYC grew by 32% during a severe economic recession when other regions experienced sharp declines. We are grateful to the organizations and leaders who have taken part in our ongoing field research in the New York City metropolitan area. Below is a list of organizations that support our research and have taken part in the first round interviews. Would you like to offer your support to this project? We are pleased to support research spearheaded by Cornell’s CSES examining the technology sector in cities like New York. In New York City, the growing technology sector continues to diversify and strengthen the City’s economy, creating jobs across a spectrum of related industries and generating critical economic activity and opportunities at all levels throughout the five boroughs. This exciting body of work has the potential to inform policymakers, practitioners, and other stakeholders looking to encourage the growth of tech clusters in cities around the world by suggesting potential strategies and best practices. We look forward to our continued partnership with Professor Nee and CSES, and eagerly await the results of this promising research project. NY Tech Meetup is pleased to support the research examining the growth of New York’s technology sector being conducted by Cornell’s CSES. We have been part of the New York technology ecosystem for the past decade, during which time we have witnessed tremendous growth in the tech community as a whole and in our own organization. We believe that research of this type is key to informing and influencing policy and future growth in a way that benefits all of New York’s citizens. We look forward to continuing to work with Cornell and Professor Nee on this project. We, at ERA, think the project being conducted by Cornell’s Center for the Study of Economy and Society would be helpful for NYC and we look forward to the research findings and how these findings can be leveraged to improve NY’s start-up ecosystem further by attracting capital, human and technical resources in to the city. We are delighted to see CSES’s commitment to understanding the organic development of the technology industry in New York. We believe this market is in an extraordinary period of creativity and collegiality. We are fortunate to have been a part of this community from the beginning and proud to be associated with so many great entrepreneurs, innovators, co-investors management teams, and now academic researchers. Our project brings together an international team of researchers that includes sociologists, economists, network analysts, and statisticians. Victor Nee leads the Cornell-based research team. He is the Frank and Rosa Rhodes Professor in the Department of Sociology at Cornell and the Director of the Center for the Study of Economy and Society. 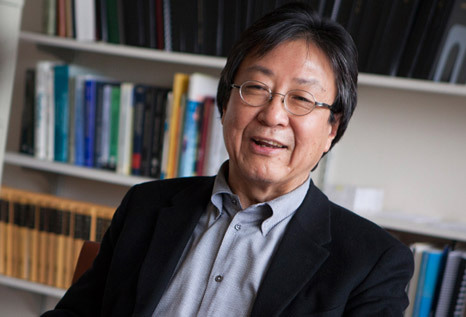 Professor Nee’s research interests in economic sociology examine the role of networks and norms in the emergence of economic institutions and organizations. In 2006 he was awarded the John Simon Guggenheim Fellowship, and was a Fellow of the Center for Advanced Study in the Behavioral Sciences at Stanford and the Russell Sage Foundation. 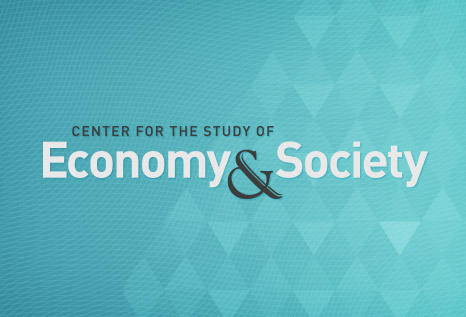 The Center for the Study of Economy & Society (CSES) is a research institute, incubator and training center focused on advancing the sociological analysis of economic markets and action. CSES’s mission is to create a multi-disciplinary research agenda and promote an environment conducive to research—both in carrying it out and making it financially possible. Since the start of 2009, investors have poured over $8 billion into New York-based start ups across 1205 deals. At its current run rate, 2013 will set a five year-high in venture capital deal and funding levels. The NYC Tech Ecosystem can be seen as a complex institution with interacting component parts to connect entrepreneurs and firms, share information among the tech community, and support local startups and entrepreneurs. The financing of this ecosystem involves a complex set of large and small organizations—venture capital funds, angel investors, and incubators, etc. Legal information and support flow through the ecosystem by way of specialized law firms and internal legal divisions. Engineers and R&D teams throughout the ecosystem are connected through the NY Tech Meetup, General Assembly, Flat Iron School, and the new applied sciences universities. This complex institution, and loose knit network that it supports for startups, is how we define the entrepreneurial ecosystem and will be the focus of our NYC research. 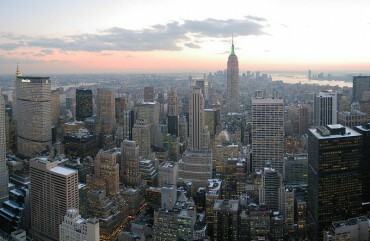 Of the seven leading technology regions in the United States, New York City was the only one to see an increase in the number of VC deals between 2007 and 2011. Our research team is currently conducting field research in the New York City metropolitan area, and would like to share notes and early empirical findings from the field as well as provide information about the vibrant and quickly growing NYC Tech Community. New York City’s share of the nation’s private sector employment has reached its highest level in 20 years because of the growth of the tech/information sector. We are seeking CEOs and Co-Founders of NYC start up tech firms to participate in our project. The first stage in our research is to sit down with important actors in the tech community over the last 10 years, including the executive teams at NYC high tech start-ups, NY Tech Meetup, VC funds, accelerators, incubators, educational institutions, and governmental organizations. We would be delighted to sit down with your leadership team to discuss why your organization was established in New York City and gain insight from your experiences with setting up a NYC entrepreneurial venture. Your experiences and insights are invaluable to understating the Made in New York City tech start-up.